Our holiday traditions consist of baking cookies with family and friends, snacking and talking and having a ton of laughs along the way. Let me tell you, a kitchen full of laughter is absolutely THE way to go. I love it! Yes, we’re making music with Toll House morsels of goodness. No lie. 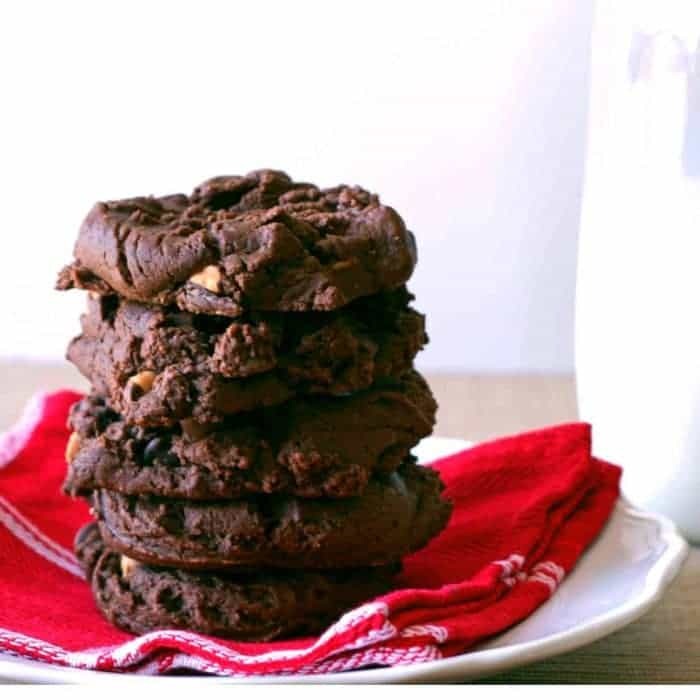 These Double Chocolate Peanut Butter Cookies might as well be called Double Chocolate Double Peanut Butter Cookies, because we’ve loaded them up with the perfect ingredient for Holiday DelightFulls recipes. 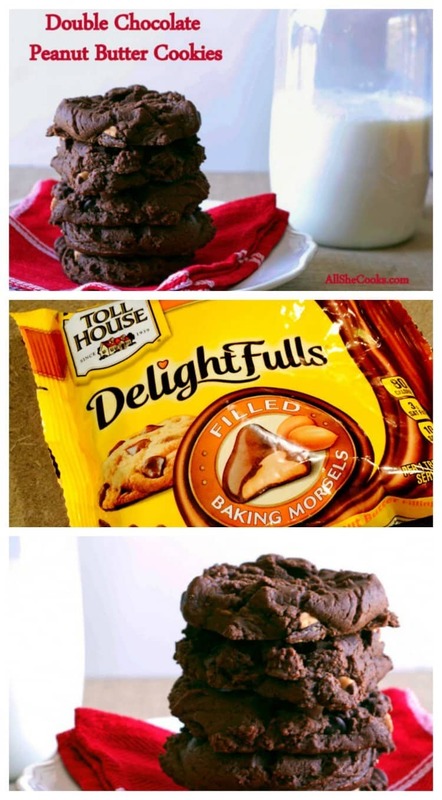 Toll House morsels filled with peanut butter. For real. If that wasn’t enough–you guessed it–we added in some extra peanut butter chips. 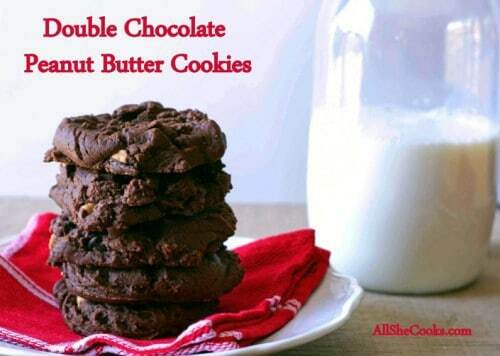 Yes, we love peanut butter around here, especially when making easy Christmas cookies recipes. One of the joys of spending winter break at home with the kids is knowing I will have plenty of opportunities to bake with my daughter. My son isn’t really big on helping out in the kitchen anymore, being 14 and all, but my daughter still enjoys that quality time. Baking together during the Holiday Season, while listening to Christmas songs playing in the background, is a wonderful way to spend time together. Not to mention the amazing memories we make along the way. I attempted to take a bite and savor the flavor, but quickly found myself taking another bite and another. Yeah… savoring the flavor didn’t work so great for me. Soften butter and peanut butter together in microwave in a microwave safe bowl. Cream together with sugar and then mix in eggs until smooth. In a separate bowl, mix together next 5 ingredients. Add to the wet ingredients and mix until well combined. Stir in chocolate and peanut butter chips until evenly dispersed. Use a 1-inch cookie dough scoop or shape into balls about 1-1 1/2 inches depending on the size of cookie desired. Drop cookie dough balls onto cookie sheets and use a fork to press the cookies down (just like peanut butter cookies). Cookies will spread a little. Bake for 10-12 minutes. Take cookie sheet out of the oven and let cookies sit for 3-5 minutes before removing to a cooling rack. Delicious, right? What’s your favorite cookie?